A trend in modern brewing is the greater use of late steeped hop additions for many styles. These include steeped hop additions, whirlpool hops, use of a hop-back and even dry hopping. Surprisingly, most of these late additions are not done to increase bitterness, but instead to exploit hop oils which play a significant role in many beer styles. When designing a new beer recipe, many brewers get very focused on the bitterness level of the beer, traditionally measured in IBUs (International Bitterness Units). Bitterness comes from the alpha acids in hops (in chemistry terms these are the humulones: humulone, cohumulone, adhumulone). During the boil, these alpha acids undergo a chemical reaction called isomerization which transforms them into bitter compounds – the traditional bitterness we taste in beer. This hop bitterness is critical for beer, as it counterbalances the sweetness provided by barley malt. 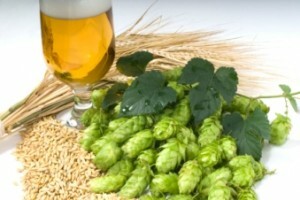 However, the focus on bitterness (IBUs) ignores many of the other flavor compounds contributed by hops. Early on, brewers recognized that just dumping hops in a pot and boiling them for 90 minutes resulted in boiling off a lot of the flavor that hops contribute, even though it did create the needed bitterness. So we started adding later additions at 30 minutes, 15 minutes, 10 minutes or 5 minutes from the end of the boil to preserve some of the flavor compounds that contribute to great beer. More recently science has helped us isolate many of the flavor compounds in hops, and understand how to preserve those flavors. Surprisingly, some of these flavor compounds vaporize at temperatures well below boiling, so the simple act of boiling hops, even for a few minutes, eliminates these oils. Also most of these oils are prone to oxidization (from exposure to air) so adding them early in the boil can also oxidize the oils from both oxygen still in the wort and also oxygen in the air during the boil, as well as when we aerate the wort before fermentation. These volatile flavor compounds are referred to simply as “hop oils” or “essential oils”. To take full advantage of them, you can’t boil the hops. In fact even steeping them at high temperature is a bad idea – so home brewers and some commercial brewers have moved to steeping at low temperature, dry hopping, and using a hop back or whirlpool system to infuse these hops after the boil. Many have had spectacular results. Myrcene – (147 F/63.9 C boil point) – The largest of the hop oils, making up 40-60% of the hop oil content in many American varieties (Cascade has 50-60%), though most noble hops are low in myrcene (Saaz: 5-13%). Mercene boils off readily, and can even volatilize in a high temperature steep (147F), so you will lose it if you boil it. It has a herbal note that can be described as green, balsamic, hoppy in small quantities. It also has a slight piney/citrus flavor. As a result of its low boiling point, it is present in much higher quantities in dry hopped or steep-hopped beers. It tends to provide a “green hop” or fresh hop aroma when used in dry hopping. Humulene – (210F/99C) – Humulene is the traditional noble hop oil, providing a strong herbal component most people associate with noble hops. Humulene is actually widely used in the perfume industry for its herbal characteristic. Over long boils, it also tends to produce a slightly spicy flavor – such as that from Saaz hops in light lagers or Nugget. Because it boils just below the boiling point of water, it usually provides its best characteristics as either a late boil addition or post-boil addition. Humulene will not survive a long boil, and is also prone to oxidize. Caryophellene – (262F/129C) – Caryophellene is a counterpoint to humulene – and provides a spicy, woody, earthy and even citrusy flavor. Clove and pepper contain this oil in significant quantities. While not a significant in noble hops, Caryophellene is a major aroma component in many traditional English hops such as Goldings and Northdown as well as many US hops such as Mount Hood. In beer it contributes a strong dry wood, pepper and earthy spice flavor. It may even add a citrus finish. Many hops are rated by their Humulene to Caryophellene ratio with noble hops having a high ratio of 3:1 or more. Caryophellene oxidizes rapidly, so fresh hops must be used and are often added late to preserve the flavor. Farnesene – (203-257F/95-125C) – Found in the coating of apples and other fruits, it provides the “green apple” flavor as well as flowery, citrusy, woody and at the extreme end musty, woody or vegetative. Farnesene is the smallest of the hop oils – typically less than 1% of the hop oil content, but it can be higher in many noble varieties. Again because it oxidizes rapidly it is best preserved as a late or post boil hop addition. Looking at the hop oils above, we can see several common themes. First, three of the four oils oxidize easily when exposed to air. As a result hop processing and storage is really important for preserving these oils. Fortunately the microbrewery industry has been a driving force the last 10 years in improving hop processing and packaging, and also they have been driving the availability of a much larger variety of hops. However, as a homebrewer, you need to be aware that the moment you open your vacuum sealed foil pouch of hops you are exposing your hops to air, and starting to degrade the hop oils. Oxidization also happens more rapidly with temperature, so storing your hops in the freezer until needed is important. Another key point is that three of the four major hop oils have a boiling point below 212F/100C – so the act of merely boiling your hops for any length of time will start to boil off these flavor oils as well. So when designing a beer you may want to consider (in addition to your main bittering hop addition) adding your aroma/flavoring hops after the boil has ended. In fact if you want to preserve the Myrcene component it should be added after your wort has cooled below 147F/64C. There are several methods for preserving these oils including steeping hops after the boil, during your cooldown, using a hop-back, whirlpool additions and of course dry hopping after fermentation. All of these have the advantage of not boiling off the oils, and also a much lower risk of oxidization as the boil or fermentation remove most of the oxygen from the wort/beer. I’ve been experimenting with moving most of my late boil additions to post boil – usually a combination of steeping some hops while cooling the wort and also dry hopping with good results. Many small commercial brewers are also extensively using these techniques with great results. I still use boil additions, though I now use them primarily for bitterness. Thanks for joining me this week on the BeerSmith Home Brewing Blog. Please subscribe to my newsletter or podcast for weekly thoughts on homebrewing! I’ve always been curious on how specific boiling points of oils affect the flavor and aroma of beer. Thanks for the write up, very informative! This is a great article. Thank you for posting. Really made me step back and make changes to my IPA brewing process. I can’t wait to review the results. Good article… but lacks any real information. It would be more useful to have a table with the average content of Myrcene, Humulene, Caryophellene, and Farnesene in various (if not all) hop varieties. You listed some examples, but a comprehensive table (or a link to one) would make this article indispensable. There are a good few things to think about when putting your recipe to gether. The hop additions are only really relevant if you are being careful with your ultimate bitterness; why bother with aroma if your sole aim is to extract tonsil cleansing bitterness with EBU’s of 50+; your taste buds are shot to hell, and as a result you may get a whiff of aroma, but you will not get any of the follow through. I am delighted to hear from my American brewing friends that at last flavor is the driver, and not the attempt to create wild floor cleanisng quality beers with way over Zealous bitterness. God gifted us brewers with a set of raw materials that when blended to-gether become some of the finest drinks given to man, and it only take s man to XXXk it up. The key is to get a detailed analysis from your hop merchant, and check the myrcene for aroma, and very late additions, and watch the cohumolene for the tartness of the hop if you use it early in the boil. There are many reference books out there, but each year the analysis will be different. I have a spreadsheet which marries Brand to talent, and then I use them sparingly to get average,EBU of 33-35, and where we go more to use Malt to offset it. This is a fascinating debate and one that I have been developing for us and our planned expansion to the states in 2013. This makes me want to try an experiment in the experiment section of my blog to test how well the flavors of all the oils are extracted by whirlpool hopping at or below 147 Fahrenheit. I would assume this to be the best strategy for keeping as much of all the hop oils into the final brew, I will have to test it and report back! As if Beersmith isn’t cool enough, Brad had to come along and post this! Great article. In it you suggested that aerating the wort is a source of oxidation of hop oils/compounds. This makes sense to me. However, have you seen any data that suggests that this creates a noticeable change in the flavor of the finished beer? Have you noted any difference in your own experience. If so, is this not a good argument to use dry yeast in hoppy beers as dry yeast should not require the introduction of additional O2 for a good fermentation? What are your thoughts on this? Thanks. Where are you getting your information on boiling point of the oils? I’m no chemist but I can do internet searching. Every article I’ve read on the chemical says the boiling point of Myrcene is ~167F. Oxygen is good for yeast but bad for essential hop oils. We just can’t win. Boiling points are important but one needs to understand Heat of Vaporization to better understand how temperature impacts aroma losses. Ethanol evaporates long before it boils (BP 179F) and if left open in a warm room it will very quickly evaporate. The amount of energy required to evaporate is the Heat of Vaporization (highly simplistic here but it works). Most of the hop compounds that contribute to both flavor and aroma (yes they are different) have HoV so low that they are partially lost during the hop drying process. Most people find general info on hop oils and attribute their characteristics as determining hop aroma character. However if one reviews the oil profiles for considerably different varieties (Columbus and Willamette) they will find some variation in the oil ratios however it is the small molecule fraction and glycosides that truly make one variety citrusy and another woody and savory. Linalool, geraniol, citronella, amylacetate, carvone, etc are the real character builders. This is a great article and very usefull. As a new home brewer this add valuable knowledge. How exactly do one add the late hop additions to the cooloing worth without risk of infection and exposing the hop to boiling water, that will burn of the oils? Should it be added directly from the freezer?